Adele Colson (left) talks to Isabel Abdouch (right) during the first Holt Public Schools Board of Education meeting on Oct. 1. The students serve as advisers to the school board. 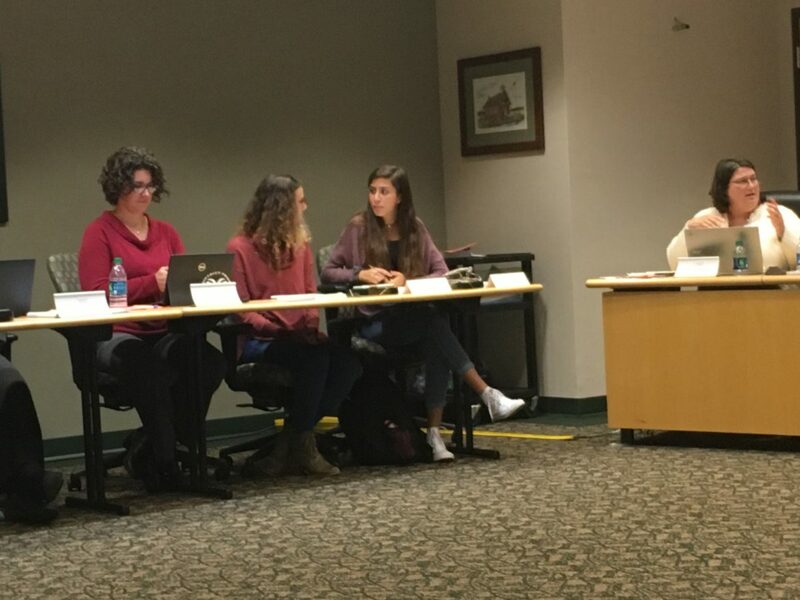 After 18 months of discussion, the Holt Public Schools Board of Education added senior Adele Colson and junior Isabel Abdouch as student representatives to serve as the voices to their peers. They joined the board for its Oct. 1 meeting. “These two were elected by their peer groups, with one being a junior and one as a senior. Moving forward we expect them to have a report for you,” Superintendent David Hornak said. Abdouch applied for the position after hearing about it in her journalism class. She helped shared the link through the school’s social media site. Colson applied after learning about it in one of her classes. She didn’t think she would win at first after she joined homecoming court, but when she found out the news she was excited to be able to represent her fellow classmates. She hopes to bring a new voice to the board and bring up issues to help her peers succeed in school. During the meeting, the board looked at K-12 reading, math and social studies test score comparisons between Holt, Ingham County and the state of Michigan from the past school year. They found Holt scores in math between kindergarten through fourth grade above the state level, with the lowest results being from the 11th grade. Abdouch talked about her experience dealing with standardized testing and how those scores may not reflect the work and effort made by students. After finishing their first meeting, Colson said she hopes the adults will accept a new perspective on how different things can affect students. Abdouch said she’s looking forward to working with the school board.